Alright, here's my most recent Saga related project! 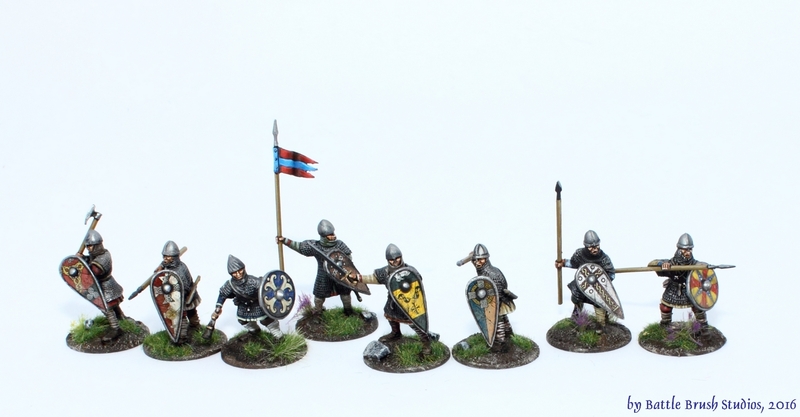 It's reinforcements for one of the Frankish warbands I built/converted and painted for a customer a while ago! It's 2 units of Warrior with bows and 1 unit of heavily armoured Flamish mercenaries. I talked about the archers at length in my review. It's pretty much the models right out of the box. 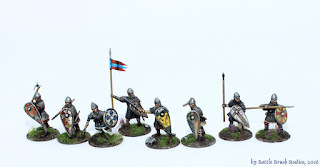 They come with one leader per unit (carrying a sword as well as a bow) and I added Saxon Thegns helmeted heads to six of the guys to make them look more like warriors rather than levy. The Flamish mercenaries are pretty much exactly 50/50 Conquest Games and Gripping Beast (Saxon Thegns box) plastics. Rememeber, one of the customer's ideas for this warband was "all plastic, please!". Of course the two kits are somewhat not-quite-compatible. GB's arm bits end at the shoulders, Conquest's end at the elbow, the necks on GB torsos are sculpted on, the necks on Conquest minis are sculpted onto the heads, Conquest have arms sculpted onto the shields, Gripping Beast don't and so on. Anyway, it was alright to convert. The main goals were big shields and lots of armour. In games terms these guys have amazing armour, but slower movement.